Recommendations conflict, and opinions are strong on whether calcium and vitamin D supplements after menopause do help bone health. Progesterone certainly does, but what else works? A New Way To Prevent Osteoporosis? An analysis of a major trial has been published in the journal of The North American Menopause Society and they are coming down on the supplement side — at least for women taking hormones after menopause. Sadly this is only about women on HRT who have a synthetic progestogen and no bioidentical progesterone or oestrogen was tested. This is a major trial of nearly 30,000 postmenopausal women of which 8,000 took supplemental calcium (1,000 mg/day) and vitamin D (400 mg/day), and 8,000 took look-alike placebos. These women came from all the hormone groups in the study: on HRT combinations, those on HRT oestrogen alone and the rest on hormone look-alike placebos. The researchers looked at how the rates of hip fracture differed among these groups found that the supplements and hormones had a synergistic effect. Women using both therapies had much greater protection against hip fractures than with either therapy alone. Taking supplements alone wasn’t significantly better than taking no supplements and no hormones. The benefit of hormone therapy was strong in women who had a total calcium intake (supplements plus diet) greater than 1,200 mg/day. Similarly, the benefit was strong in women who had higher intakes of vitamin D, but the individual effect of each one could not be determined because the two supplements were given together. The effects translated into 11 hip fractures per 10,000 women per year among the women who took both hormones and supplements compared with 18 per 10,000 women per year among those who took hormones only, 25 per 10,000 women per year among those who took supplements alone, and 22 among those who got neither therapy. These results suggest, said the authors, that women taking postmenopausal hormone therapy should also take supplemental calcium and vitamin D. Although they couldn’t specify how much, they noted that the benefits seem to increase with increasing total intake of calcium and vitamin D. The dose will depend on keeping side effects, such as constipation from too much calcium, to a minimum, they said. ow, with a study this large, there may well be. Why it is not enough? Bones need progesterone to be strong and as part of the building process and no supplement alone will do this. There are also many nutritionists and health experts who dispute whether calcium and vitamin D are sufficient and as a major source of vitamin D is sunshine we may not be getting enough of that in the northern hemisphere! 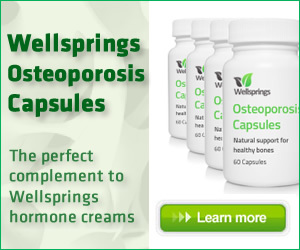 Given the serious side effects of osteoporosis drugs such as Fosamax it is tempting to think that just supplementing with calcium and vitamin D will be sufficient, or increasing calcium rich foods such as dairy, canned sardines, dark green vegetables, tofu and calcium-fortified juices and soy milk. Together with weight bearing exercise, those steps will all support bones, but for real effective help it is only bioidentical progesterone that can stimulate the osteoclasts in the necessary process to build strong bone.